A LITTLE QUIZ. Guess the color channels in the photo below. This is a photo of a hot air balloon, taken in a brilliant blue sky. We see here the three color channels of my original color image, along with a black-and-white conversion of the image, using the Photoshop Desaturate tool. Please see my earlier posting, Color Spaces, Part 1: RGB. Mastering the channel structure of color images will give you more control over your final images, since it replaces guesswork and trial-and-error with certain knowledge. Remember, in the RGB system we have one channel each for red, green, and blue light. For the red channel, if it is black, that means no red is present, and if white, then the red component of color is brightest, and likewise for the other two colors. What color are the stripes on the balloon? Actually, there is another band of a different color, near the top of the balloon. What is its color? It would be cheating to look at my picture of that balloon wouldn't it? Of course it would be cheating. Shoot, he's not going to post the answer, is he? I thought A was desaturated and B was green. The main clue is the blue sky. We always can be sure that Blue > Green > Red, therefore D = red and C = blue, since the sky color is darkest in D and lightest in C.
If B is the green channel then the color of the balloon ought to be a shade of orange, since red is high, blue is low, and green is intermediate. If A is the green channel, then the color of the balloon is red. The Desaturate tool produces shades of gray according to the relative luminance of colors; so yellow will be light and blue will be dark. 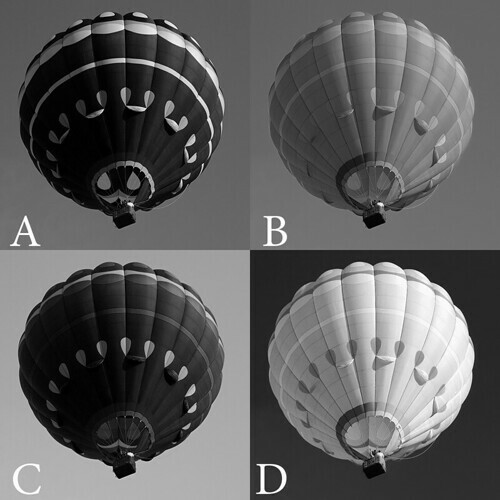 Because of this, we can eliminate A as the desaturated image because the ballon is very dark here -- it ought to be brighter because we have a very light red channel. So B is desaturated, and A is green. We now now the balloon is red. Immediately we can see that the lower stripes on the balloon are light in the red and green channels, and dark on the blue and so they must be yellow; remember that the anti-blue or opponent color of blue is yellow. The top stripe is light in all three channels, and so is a shade of gray. For a color image click here.